Giving the item as a gift? Please also see the Terms & Conditions page. All of the prices shown are the total that you pay, for delivery within the UK and includes gift wrapping, postal container and first class postage. Please see below for posting overseas. Prices remain constant, despite postal rate increases. Once priced, a piece remains at that price until sold, but if it's re-made, the price will be adjusted to reflect prevailing costs at the time it is made - so there are occasional jumps in price on individual items as stock is replenished. 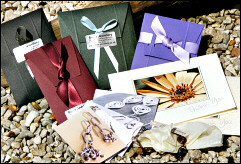 First class postage (and gift wrap and packaging) is already included in the displayed prices. In the shopping basket and checkout process, there is the option to choose 'Special Delivery' - a postal service upgrade at an additional fee of £5.50. Please always check with me before selecting this option as it is not always possible to post items out in the timescale you may hope for. Special Delivery items also require a signature on delivery and will not be left without one if you are out at work. As we don't have a local post office, my orders always leave to be posted first thing in a morning, often the day following the order being placed. I am therefore unlikely to be able to post an item, by Special Delivery, the same day that it is ordered. Please contact me by one of the methods on the Contact page to discuss options before placing your order, if you require it in a timely manner. I will always endeavour to get items to you by your required date, but Special Delivery postage may not always be the fastest or best option. If you pay for the Special Delivery service and I am unable to facilitate this, I always refund this fee in full. Please see the announcement box at the top for details of a temporary change in service times. Orders for in-stock items will usually be posted out within 2-3 days of the order being placed and full payment made. This timescale allows me time to polish and gift wrap the item for you and to check back with you if there are any queries about the order. Dispatch will be a little longer if the item needs alteration and certainly longer if it is to be made to order. You will however be kept fully informed on the progress of your order. For example, if you were to order an in-stock item during the middle of a weekday, it is likely that it will be posted the following morning, or if you were to order late on a Friday evening, it is likely to be posted on Monday or Tuesday. Because I do everything myself, I work to a routine that will allow me to both deal with orders efficiently, but also allow me sufficient time to work on re-making stock and also developing new designs. Therefore, orders placed after 6pm UK time will be treated as received the following day and weekend orders will be attended to on Mondays. You will always be advised when the item is actually dispatched and I safely retain all documentation so that orders can be traced and monitored. The shop generates e-mails to you whenever I change the status of the order and I often add comments directly to the bottom of these messages, so please do look out for personal comments specific to your order - I often use this opportunity to confirm that I have observed any specific requests. If you require items as a gift for a third party and have special instructions, please leave details in the comment area of the shopping basket, or e-mail me separately with details - I'm happy to accommodate special requests where practical to do so. Please note: once items have been entered into the postal system, I have no control over delivery times or how an item is handled. Please see the Royal Mail web site, for an indication of their stated intended delivery expectations for different regions. They publish 1-2 working days for the UK first class post and 3-5 working days for airmail overseas. Guaranteed services cost at least an additional £5.50 - but contact me before ordering with the item you're interested in so that I can get an accurate price for you. Items for delivery outside the UK incur an additional £3 shipping supplement to cover the higher rates of global airmail postage. I am based in - and ship from - the UK. So please remember when you view your shopping basket to select the £3 shipping method 'To all addresses outside the UK', if the delivery address is outside the UK. 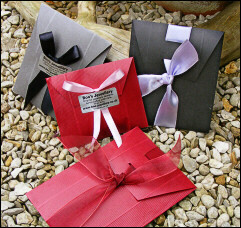 Presentation wrapping, similar to shown, and post and packing is included in the displayed prices. Items are sent first class post to locations in the UK and by airmail to overseas locations. If you require a different service, such as 'Special Delivery', please contact me for availability etc. BEFORE buying. It is available as a postage option during checkout, but please check on when I can actually send it before selecting this option. Some individual items of high value have Special Delivery included in the price, but this is detailed on the individual product page. A signature will be required upon delivery of these particular items. All jewellery items are supplied wrapped in acid-free tissue, in presentation packaging (you deserve it, even if it's a gift to yourself), with a care sheet listing the materials used. Most items are now sent in hand made gift envelopes, as shown, or fabric bags and then packed securely in rigid flat postal boxes (the size used for DVDs). I have found this to be a very secure way to protect the contents through the post, eliminating any movement of the piece in transit. The packets are also slim enough to go through most letterboxes if you're not in when the post comes and they represent a significant postage saving as they go as 'large envelopes'. I have sent my packets all over the world and everything has arrived safely. Because my packing is thorough, I expect items to reach you in perfect condition. In the interests of preventing unnecessary wastage, some external packaging materials are re-used where possible, such as clean bubble wrap. If you're buying the jewellery as a gift for someone else, please let me know in the comments box during checkout and I'll leave the wrapping un-sealed to allow you to inspect the piece and will enclose some fresh spare tissue paper for re-wrapping for giving. If you'd like the item sending directly to the recipient with a gift card, I am happy to do this for you, but please e-mail me before ordering to ensure that I can fulfil your wishes in the timescale that you'd like. 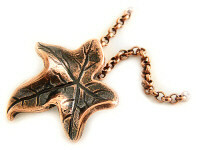 Copper is the traditional gift for 7th wedding anniversaries and bronze for the 8th anniversary. So if you're buying a piece for your wife to mark the occasion, please let me know in the comment box during checkout so that I can wrap it accordingly, as above. Where the order appears to be being sent to your home address, I mark the parcel as 'Private and Confidential' and remove all logos and markings to aid in the secrecy. I really appreciate my gentlemen customers, so am happy to help you to make everything as perfect as possible for your celebrations. A good range of photographs of the items from different angles is provided on all product pages and pertinent sizes are included in each listing, stated in both metric and imperial units. Please note that the photographs tend to show small jewellery items larger than they are in reality, so please check the stated sizes against a ruler to ensure that the finished item will meet your needs. If you want something a different size than stated, especially with necklace lengths, in most cases this is possible and often within the same price, so please feel free to ask. Some adjustments may necessitate an adjustment in price if more materials are used, but you would be advised of this before committing to purchase. International buyers are wholly responsible for any taxes or duties due on the item as it passes through customs and there may also be collection fees charged by the carrier. So please familiarise yourself with the import thresholds applicable for goods for your region - I will always work with the customer to work out the best way to dispatch items, so please feel free to discuss options with me. Appropriate and accurately completed custom forms and invoices always accompany each overseas parcel. I will not put inaccurate information on customs forms for the purpose of evading import duties. After progressing through several checkout stages of the site shopping cart (the various stages allow you to add a separate delivery address or add comments, sizes etc.) your order is directed to PayPal for payment. You don't need a PayPal account to buy in this way, there is a link below the PayPal log in boxes to 'pay with a debit or credit card' or 'Check Out as a Guest' if you prefer to use a card. If you would prefer to pay by bank transfer (BACS/FPO etc. ), using your on-line banking service, please contact me for my account details, I keep these in a document that I can e-mail to you. There is no fee charged for you using the PayPal service, but please note that if your bank or credit card does not operate in Sterling, they may make a charge for the currency conversion. Using PayPal in this way offers you additional security as your card details are supplied to them, not me. I do not at any time see your bank or card details, just your name and address. Why do I have to register on the site? It is necessary for you to register on this site to complete your transaction, the cart simply won't work unless you do. The benefit is that you can log back in and see your order history and progress of any outstanding orders and are automatically updated by e-mail as your order progresses. It also ensures that stock levels are maintained on the site, so you can't be charged for an item that I no longer have in stock, if just purchased by someone else. If you would really prefer not to have to register to place an order, and I understand that having yet another password to remember can be tiresome, please contact me by e-mail, letting me know which items are of interest and I can send you a PayPal invoice for the amount and manage the transaction manually. Don't forget that I'll need your accurate PayPal e-mail address and full postal address in order to proceed. Please note that the PayPal cart is in the name 'Boo's Jewellery' and payments will appear on your bank or credit card statements, if you pay this way, to BOOSJEWELS. I make everything myself, often to order and if you don't see exactly what you want, or would like a slight modification, please feel free to ask. I am also happy to consider custom orders based on current or sold designs. I am very happy to make variations of my own designs already featured on the site, where possible and suitable materials are available. Such pieces can usually be made within similar price ranges as already shown on the site, with modest adjustments for differently priced materials or sizes. But due to the considerable time it takes to work on brand new unique pieces, I am unable to undertake commissions, at the present time, for pieces that are totally different from my own published designs. Bracelets are measured as they would sit in the wrist using a measuring cone shaped mandrel. The linear length of a finished bracelet may not be a useful measurement, as the diameter of the beads makes a big difference to how it will sit in wear. So I sit the finished pieces on the cone and measure the diameter of where they sit, as they would on the wrist. To measure your wrist, use a soft fabric tape measure (or string or ribbon and a ruler) to take a measurement around your wrist above your hand - wrap it round tightly but with a finger underneath for some ease. Depending on how loose you like to wear bracelets, add ½" / 13mm for a snug fit, add 1" / 25mm for a comfortable fit on the top of your hand, or more if you like a bracelet to dangle more loosely. This figure is the 'fit' figure of the bracelet. So if I describe a bracelet as a 178mm/7" fit, that would sit comfortably on the top of the hand for someone with a wrist measurement of 6" and allow some movement. As a further check, measure the lowest point where you'd like the bracelet to sit on either your hand or up your forearm and see how this compares to the earlier figure you calculated. Alternatively, use the measure given for the bracelet you like to see how the particular item will fit on you. Many of the bracelets can be adjusted, but in most cases, this will only be by the increment of one of the links, but smaller adjustments may be possible by using extension links around the clasp area. Comments are made with individual items, but please ask if you don't find an answer. Buying a bracelet for a gift or want one to fit like your favourite? If you want to choose a bracelet to give for a gift it can be tricky to know what size it needs to be if you can't measure the recipients wrist without giving the game away. The next best thing would be to measure a bracelet that you know she likes the fit of. Measuring the linear length of a bracelet is unlikely to be satisfactory unless it's a very fine chain - wider bracelets and those with chunky beads will be deceptively long, allowing for the diameter of the beads against the wrist - lifting the central core of the bracelet away from the skin. 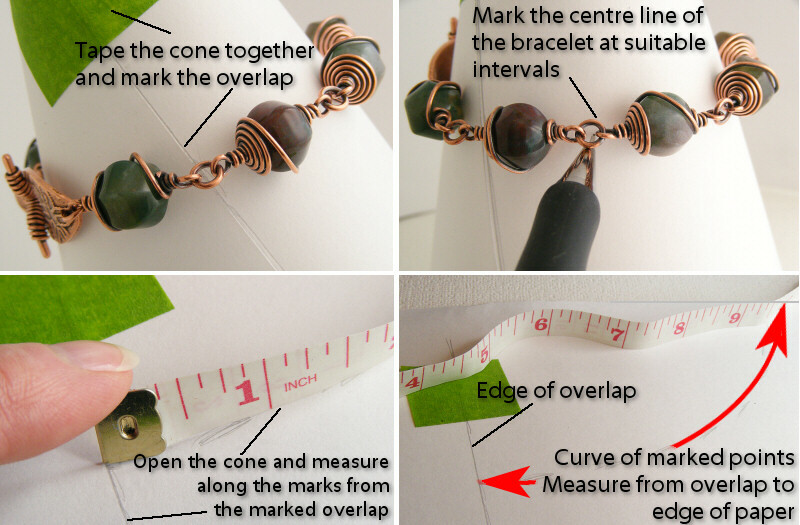 The best way to measure a bracelet fit is to curl a piece of paper into a cone, one of a suitable diameter that dropping a fastened bracelet over it will stop part way down and sit on the cone. Use some sticky tape that you can later undo, to fix the paper into the cone at this size and mark where the overlap is - this is an important stage. Drop a bracelet over the cone and draw some marks where the centre line of it runs around the cone - it probably stands proud of the cone, resting on any wider elements like beads - so you'll need to carefully project the line back to the paper with the point of your pencil - as you can see in the top right image. 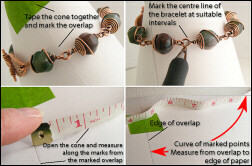 Remove the bracelet and unfasten the cone and lay the paper flat and measure the line of the marks you've made - from where the paper overlaps and you marked it - to the edge of the paper. It will be a curved line, so you'll need something flexible to measure it. This is the inner circumference - or fit - of that particular bracelet. The graphic on the right illustrates the process, please click on it to see a larger version and then use the back button to return to this page. Ideally repeat the process with more than one bracelet to get a range that you know will fit the gift-recipient. If you would like to retain a copy of the information contained on my Contact, How to Order and Terms and Conditions pages on the site, I have all of that content compiled into a single .pdf document that you can either save or print for your records. I would recommend that you do so at the time of ordering as the document may change over time. You will need Adobe Acrobat to read the document and it is around 40Kb in size. The current version is Version 3. Date last edited: 24th August 2016.